Titanic in Emotion ...in Spectacle ... in Climax ... in Cast! Determined to remove her family from the superficial, high society world in which her husband Richard (Clifton Webb) is engrossed, Julia Sturges (Barbara Stanwyck) boards the R.M.S. Titanic in England on its maiden voyage to America, along with her two children. Learning of her plans, however, Richard purchases a steerage ticket aboard the ship in hopes of reconciling with his family. But when fate, ice and an overzealous ship captain step in, the Sturges family faces an unimaginable challenge - the possibility of separation from one another forever. This classic, based on the true-life history of the famed ocean liner, remains one of the most poignant, well-crafted films of all time. And now we encounter the 1953 version of Titanic. It’s not the first cinematic version of the story. A silent German flick called In Nacht Und Eis popped up very shortly after the boat went down in 1912. It’s not the first “talkie” take on the sinking. The fictionalized Atlantic came along in 1929. It’s not the most respected look at the ship. That honor would probably go to 1958’s A Night to Remember. And it goes without saying that it’s not the most rewarded and successful edition. That prize will likely always reside with the 1997 film. So what does the 1953 Titanic have to offer? Beyond the sight of Robert Wagner as he sings and dances an absurd tune called “The Navajo Rag”, not much. Titanic opens at the logical spot, as our main characters board the vessel. Estranged from her husband Richard (Clifton Webb), Julia Sturges (Barbara Stanwyck) wants to take her late teen daughter Annette (Audrey Dalton) and adolescent son Norman (Harper Carter) to America. They’ve lived high on the hog in Europe, and she feels they need a more substantial lifestyle in the Midwest free from glitz and glitter. The snobby Richard thinks differently, but since the voyage is sold out, he has to buy a secondhand steerage ticket from a passenger and then sneak onto the first class deck to find his family. Most of the movie concentrates on the dispute between Richard and Julia, but a few other prominent characters emerge. Obviously based on Molly Brown, Maude Young (Thelma Ritter) pops up occasionally to toss out some common sense. College boy Giff Rogers (Robert Wagner) digs Annette; she initially shoots him down, but he persists and romance blossoms slowly. Finally, we meet terminated priest Reverend George Healey (Richard Basehart), an alcoholic who lost his job due to his fondness for the booze. The Young and Healey characters remain quite minor, and they don’t play much of a role in the proceedings. Actually, the whole Healey subplot seems pretty superfluous and pointless. We see so little of him that he makes almost no impact, and we’re never sure why the filmmakers bother to show him at all. Young comes across as minor comic relief at best, and also seems to exist mostly so we can connect her with Molly Brown. She has little impact on the story. The whole Richard/Julia dynamic dominates the film as they duke it out over the future of their kids. We get a little Giff/Annette action too, but the sparks don’t exactly fly, and we see so little of them that they remain a sideshow at best. What does any of this have to do with the Titanic? Nothing, and that fact badly undermines the movie. The flick runs only 98 minutes, and it’s fully two-thirds finished by the time boat meets ice. The film really flies through the tragedy after that. The captain declares the ship’s demise almost immediately, and matters resolve themselves simply and abruptly. Heck, the whole flick’s over in barely half the length of the 1997 version! Obviously historical documentation isn’t this one’s strong point; with barely a half an hour devoted to the sinking – and very little examination of the craft prior to that moment – we don’t get much information to illuminate real events. A few true-life characters pop up like the Astors, but they’re there for nothing other than window-dressing. However, the characters of the 1953 Titanic seem so stiff and dull that they never really interest us. Part of this stems from the sheer inevitability of the plot. No, I don’t refer to the fact we know the boat will sink. Richard’s character follows a simple storyline that never deviates from the utterly predictable. We know exactly what he’ll do well before he does it, and this renders any potential drama moot. Character development overall seems weak, and that renders Titanic as a pretty poor film. We don’t particularly care what will happen to the passengers or crew, and that’s about as fatal a flaw as I can imagine for a movie about the Titanic. At this point, the 1953 flick is mainly interesting as a historical curiosity and for the ways it connects to its more famous offspring. Purely as a movie, Titanic seems dull and superficial. 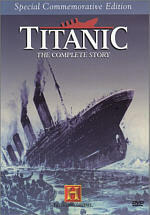 Titanic appears in an aspect ratio of 1.33:1 on this single-sided, double-layered DVD; due to those dimensions, the image has not been enhanced for 16X9 televisions. The movie looked decent given its age, but given the high quality of most Fox Studio Classics releases, this one seemed like a moderate disappointment. Sharpness appeared moderately iffy at times. Most of the movie came across as reasonably concise and distinct, but more than a few exceptions occurred. At times, the image displayed somewhat mushy definition, and it could be somewhat loose and soft. Issues connected to jagged edges didn’t pop up, but I noticed some shimmering and mild to moderate edge enhancement periodically. Print flaws cropped up through much of the film. I noticed examples of specks, marks, lines, spots, scratches, and other small defects. These never became overwhelming, but they seemed heavier than I might expect given the track record of the Studio Classics line. Black levels were moderately inky and flat, and contrast seemed a bit drab and lifeless at times. Low-light scenes were acceptably visible but they suffered somewhat from the mushiness of the rest of the image. Titanic looked good enough to earn a “C” for picture, but it didn’t present a terribly strong visual presence. Titanic offered a stereo soundtrack that appeared to come as a remix from the original mono material. As with many of the other presentations of this ilk, the results seemed somewhat weak. Essentially this meant we got glorified mono for the mix. Nothing appeared well localized, as the audio mostly just demonstrated a mushy sense of placement. Speech spread across the front and failed to remain well anchored in the center, and both effects and music felt fairly phony in the way they utilized the forward dimensions. It all became distracting. Audio quality suffered from some problems connected to the remix. The biggest issue affected speech, which demonstrated excessive reverb. The lines stayed intelligible, but the unnecessary echo made the dialogue seem less than natural. Effects showed some of the same concerns, and that led them to sound a bit artificial, though the track did demonstrate pretty good bass response given the flick’s age. Music was similarly tinny at times but also featured acceptable low-end information. Bass was a little loose but remained relatively impressive. I noticed a little scratchiness and occasional background noise. I felt this flawed remix only merited a “C-“. Happily, the DVD included the original monaural soundtrack as well as the stereo remix. The single-channel track seemed significantly more palatable. It lacked the reverb that marred the stereo version, and it sounded noticeably clearer and more natural. The stereo edition presented better bass, however, and it also featured less noise. I noticed some popping, crackling, and humming during the mono track that didn’t seem apparent in the stereo one. I’d give the mono version a “C+”; it would’ve been higher without the noise, but it still remained the superior mix. As part of the “Fox Studio Classics” series, we expect a nice set of supplements here, and Titanic doesn’t disappoint. We open with two separate audio commentaries. The first features a solo piece from film critic Richard Schickel, who offers a running, screen-specific affair. Schickel has recorded quite a few commentaries for other films, but despite his familiarity with the format, his sessions remain erratic. He can be insightful and informative or he can be bland and dull. Unfortunately, Schickel’s commentary for Titanic mostly falls in the latter category. Much of the time he simply tells us basic details about the ship and the participants in the film, but these never become terribly deep or useful. More than a few dead spots appear, and Schickel sometimes simply narrates the story. However, one interesting stems from Schickel’s lack of enthusiasm for the film. Usually commentaries from critics involve fans of the flicks, but Schickel never demonstrates much positivity toward Titanic. He generally hides his disdain, though he makes a few snide cracks at times. Those highlights aside, Schickel’s commentary seems moderately useful on occasion, but it doesn’t do much to illuminate the listener about Titanic. The second audio commentary provides remarks from actors Robert Wagner and Audrey Dalton, film historian/cinematographer Michael Lonzo, and Titanic historian Sylvia Stoddard. Typical for Fox Studio Classics releases, the participants’ screen-specific remarks were recorded separately and edited together for this piece. While not one of the best Studio Classics tracks, the discussion of Titanic seems generally interesting. Not surprisingly, Stoddard’s remarks mostly detail issues related to the historical voyage itself. She gets into a few topics connected to the film, but the facts of the vessel and trip remain her focus. Lonzo mainly gets into technical topics, with an emphasis on the film’s effects. He also chats a little about various participants, but the nuts and bolts of making the Titanic float remains his focus. Unsurprisingly, the actors concentrate on their own experiences. They discuss a little about their careers as a whole, how they got work on Titanic, and how things worked for them on the set. Of the pair, Dalton easily proves to be the most stimulating. She seems funny and frank as she chats about her memories and interactions with the other cast and crew. Wagner offers less information and provides some decent details, but Dalton gives us a lot more. As for the other commentators, Lonzo dominates, but he doesn’t seem particularly interesting. He tends to drone about fairly uninteresting details related to the miniatures and whatnot, and it gets a little old after a while. As seen on prior Studio Classics DVDs, Stoddard can be quite compelling, but she pops up too infrequently here to make much of an impact. Overall, the commentary still seems reasonably informative and worthwhile, but it’s not a great track. One additional audio feature appears. We get an audio essay called “Titanic Aftermath” conducted by Sylvia Stoddard. In this concise discussion, she goes over the actions that followed the sinking and lets us know what happened to some of the survivors. She also gets into some cinematic explorations of the topic. It’s a nice 11-minute and 20-second chat about the subject. Next we find a documentary called Beyond Titanic. This 94-minute program previously appeared in a set called Titanic: The Complete Story. 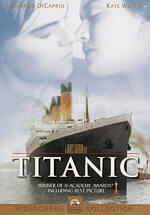 Created in 1998 - after the success of the Cameron flick and co-sponsored by Fox - this show follows the ways in which the Titanic has remained in the popular culture over the prior 86 years. Narrated by Victor Garber - who played ship designer Thomas Andrews in Titanic - the program briefly recaps the rescue of survivors and the ensuing news coverage. After that, it offers a reasonably detailed history of the disaster’s continued impact on popular culture. We hear mainly about cinematic depictions; those began almost immediately with some quick silent films from the era. Some time is devoted to books and other media - such as the recent CD-ROM exploration of the ship - but movies dominate the show. The program traces additional offerings through the years and also briefly relates the ways in which the Titanic legend fit into the mindsets of the times. One of the most interesting elements comes from the comments of a survivor. Though an infant during the voyage, Millvina Dean remains haunted by the tragedy, largely due to the loss of her father. She states that she and other survivors went to see A Night to Remember back in 1958 but found the experience to be an emotional ordeal. As such, she and others refuse to watch any other Titanic-oriented flicks, which leads to an amusing story about all the attempts folks made to get her to a screening of Titanic. Surprisingly, we don’t hear all that much about that movie. Since Fox sponsored the show, I expected a focus on the then current hit, but happily, it receives an appropriate amount of attention. Neither favored nor ignored, we learn of it as another piece in the continuing puzzle. “Beyond” is a good program, but it lacks a lot of depth and seems a bit bland at times. Still, it covers some interesting territory and merits a look. In the Movietone News section, we get two newsreels. “Titanic Premiere Thrills South” runs 68 seconds as it documents screenings at the naval base in Norfolk. “CinemaScope and The Robe Win Oscars” lasts 71 seconds as it rips through the 1954 ceremony. Neither is long enough to present much good material, but they’re nice historical additions. The Still Gallery presents 20 shots from the set. Finally, we get the movie’s theatrical trailer. 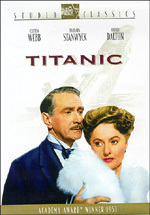 Unlike other discs in the series, Titanic doesn’t include promos for other Fox Studio Classics DVDs. I’m sure someone out there finds the 1953 Titanic to present the best exploration of the great ship’s sinking, but I find it tough to imagine why. The movie seems tedious and dull, and it focuses on extraneous character relationships without much to tie it specifically to history. The DVD presents mediocre picture and sound but it includes a solid collection of extras. Leave the 1953 Titanic to completists, as it doesn’t offer a satisfying film.